The Cranmer Family: What do you think? I was shopping at the mall today because Kirk went out on his dirt bike, and in my mind that makes us even because it's a hobby I enjoy just as equally. When I was there I noticed Guess had a "50% off already reduced jeans sale" so I bought a pair. I've been wearing them around with all the tags still on because I think they might be too short (I had fun explaining that to some missionaries we ran into on our walk). So I had Talon take some pictures of me and thought I'd get your opinion of them before I either return them or finalize it by taking off the tags. Please let me know what you think and if everyone does agree they are too short I will return them for the less cute, but slightly longer pair. 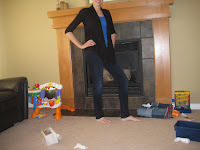 For skinny jeans, I think they are a good length. Just don't go and shrink them! I don't know much about these things as you know, but aren't skinny jeans supposed to fit that way? I think they are cute, they look a little uncomfortable, but I guess they are supposed to.